Dr. Eugenie Brunner reveals the differences between traditional facelift surgery and mini facelift, examining the benefits of each option. Princeton, NJ — According to the American Society for Aesthetic Plastic Surgery, facelift surgery is one of the top 10 most popular cosmetic procedures in the nation. 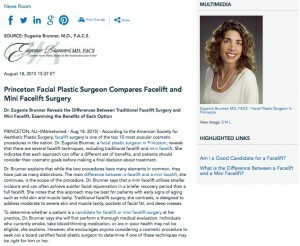 Dr. Eugenie Brunner, a facial plastic surgeon in Princeton, reveals that there are several facelift techniques, including traditional facelift and mini facelift. She indicates that each approach can offer a different set of benefits, and patients should consider their cosmetic goals before making a final decision about treatment. Dr. Brunner explains that while the two procedures have many elements in common, they have just as many distinctions. The main difference between a facelift and a mini facelift, she continues, is the scope of the procedure. Dr. Brunner says that a mini facelift utilizes smaller incisions and can often achieve subtler facial rejuvenation in a briefer recovery period than a full facelift. She notes that this approach may be best for patients with early signs of aging such as mild skin and muscle laxity. Traditional facelift surgery, she contrasts, is designed to address moderate to severe skin and muscle laxity, pockets of facial fat, and deep creases. To determine whether a patient is a candidate for facelift or mini facelift surgery at her practice, Dr. Brunner says she will first perform a thorough medical evaluation. Individuals who currently smoke, take blood-thinning medication, or are in poor health may not be eligible, she explains. However, she encourages anyone considering a cosmetic procedure to seek out a board certified facial plastic surgeon to determine if one of these techniques may be right for him or her. Ultimately, Dr. Brunner believes that having access to a wide range of facial rejuvenation options can benefit patients. She says the multitude of techniques available can allow a skilled facial plastic surgeon to customize a treatment plan to suit the anatomic needs and cosmetic goals of the individual. As a result, Dr. Brunner notes that a longer lasting, more natural-looking outcome can often be achieved. Dr. Brunner is certified by the American Board of Facial Plastic and Reconstructive Surgery as well as the American Board of Otolaryngology (head and neck surgery). She received her undergraduate degree from Rutgers College and her medical degree from the Robert Wood Johnson Medical School – The University of Medicine and Dentistry of New Jersey. A two-time recipient of the Patients’ Choice Award, Dr. Brunner is also a Fellow of the American College of Surgeons, a Fellow of the American Academy of Cosmetic Surgery, and a member of the American Society for Laser Medicine & Surgery. She is available for interview upon request.